Option 1: Put God in the hot seat and say that it is all His doing. Is there a burning desire in God’s bosom to make people suffer? No. If this were the case and the Father’s will was already automatically being done on the earth in every instance, Jesus would have passively went about ministry saying, “Oh, you’re demon possessed and sick because that’s God’s will”, and gone right on His way. This wasn’t the case considering Christ Himself said a kingdom divided against itself cannot stand (see Matt 12:25) yet a lot of believers go about their day with such a mindset about possession and sickness in the world. Also, if this viewpoint is taken too far, then when Jesus rebuked the storm on the boat with His disciples, it would mean that He was rebuking something ordained of God (Lk 8:24). Option 2: Everything bad that happens is from Satan. Well, last I read in my Bible, in both testaments, God judged places and people pretty harshly at times. Certain nations like Sodom and Gomorrah were annihilated by fire for their blatant rebellion and Ananias and Sapphira were quite literally slain in the Spirit as an act of God’s judgment, not to mention King Herod and Elymas (Genesis 19:24, Acts 5:1-11, 12:23, 13:9-11). Not to mention that some things in the world are subjectively bad. From the child’s perspective, being disciplined is bad, but from the parents’ perspective, it's good for her. We too must acknowledge that as imperfect children, there will be times when God disciplines us when we step out of line, but will we trust Him to discipline us appropriately? Option 3: Natural disasters should be attributed to the impersonal force of karma. Karma is essentially a made up system of explaining why bad things happen. The short version says, “Bad things happen to bad people and good things happen to good people”. This gives people a sense of control over their lives. In one sense, it is like Job’s friends crowding around him and saying, “You’re in bad shape because you sinned,” which we learn at the end of the book of Job is far from true. In New Testament instances, Jesus was the best human being who ever lived and He experienced crucifixion, not to mention what happened to all of the apostles and early believers. As you can see, a couple of such instances can quickly rule out karma as a viable option. The longer the world spins on its axis, the more we can prove that karma does not exist. Option 4: God is not in control, He has let nature run its course. One could argue that this viewpoint finds some support from Romans 1:24 when Paul acknowledges that God has given people over to their selfish desires. Yet it ignores the fact that it is God who gives people over to things according to their actions, and that God is actively involved with our lives, pointing us to Him through what we go through, even a natural disaster. Option 5: What all of these viewpoints fail to take into account is the fact that God has the choice of whether to judge people now or on the future day of judgment, which makes it possible for God, Satan, nature, or our own sins to be the ‘cause’ of any natural disaster. What we should focus on in the midst of natural disasters is not whether people are being judged and reaping what they’ve sown in the here and now, because that will happen one day anyway. 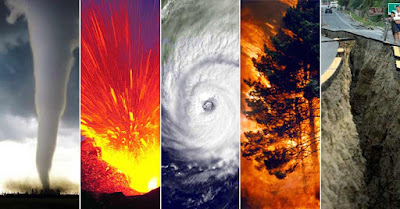 Nor should we too quickly shout out what has caused the natural disaster and why. What matters is what Paul says to do in response to knowing that we can sow to the flesh or to the Spirit: Do good to all people. By this, we can ensure that anything we do in this life is sown into our inheritance: eternal life. Ultimately, we know that God allows natural disasters to happen. Why? Perhaps it’s so we learn to pray against Satan’s schemes because we’ve forgotten, maybe it’s so that we learn to serve and come together since we have avoided each other and divided more and more as a country, perhaps it’s because we have gotten too focused on ourselves that we have forgotten others, maybe a given natural disaster will bring one more person into the kingdom who wasn’t in it before, or perhaps it is because we have forgotten Him due to our overly materialistic lifestyles. Ben Sira, an ancient Jewish writer, puts it well: “Don’t follow your inclination or your strength, in order to walk in the desires of your heart. And don't say, "Who'll have power over me?" When the Lord punishes, he will punish. Don't say, "Sure, I sinned, but what happened to me?" The Lord is patient indeed. Don't be too confident of being forgiven, adding sin upon sin. Don't say, "His compassion is great; he will forgive the whole heap of my sins." Mercy and wrath are with him, and his anger will rest on sinners. Don't wait to turn back to the Lord. Don’t put it off day after day, because the Lord’s wrath will come forth suddenly; when the time for punishment comes, you will be destroyed." What a great way to end a blog post, huh? Well, I think sometimes we are a little too much on the ‘ best friends with Jesus’ side and don’t realize the reality that we need to fear God and serve Him, doing good in the midst of the natural disasters instead of debating what has caused them. We should be thankful that God will judge sin one day, no one is getting away with anything! Anyone who gets away with murder in court will certainly not get away with it before the throne of Christ. We shouldn’t sow to our own desires but to the Spirit, doing good to others as Christ would if He were in our shoes. Contrary to popular belief, this actually brings more fulfillment because God honors it and such is pleasing in his sight. May these disasters be used for His glory as we, the Church, come together to serve, and pray for one another even more wholeheartedly. As we serve and pray, it is not only others but us whose hearts will be changed.